The 26-foot baby whale was probably lost at sea and died of starvation or some other unknown cause, according to Brazilian nonprofit research group Bicho D'agua. When local fishermen were walking through a mangrove forest in Brazil, they came across something that shouldn't be there: the carcass of a humpback whale. 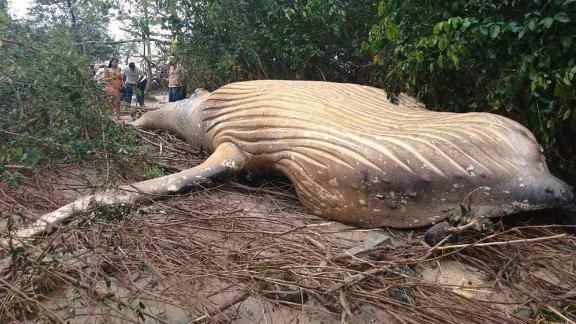 The tides washed the whale's body to shore at Araruna Beach in the city of Soure, said Bicho D'agua oceanographer Maura Sousa. It's located on the island of Marajó, which sits at the mouth of the Amazon River. "During this season, the tide normally rises twice a day to almost 4 meters (13 feet) and floods the mangrove forest, bringing lots of trash, including trash from ships from a lot of places in the world," Sousa said. "This explains why an inflated carcass, due to the gases of the decomposition, was dragged into the mangrove forest," she said. The 26-foot whale likely died four or five days before fishermen found it in the mangroves on Friday, she added. The fishermen notified the research group of the whale's carcass, which lay some 50 feet from shore. The Federal University of Pará's pathology laboratory is performing the necropsy -- an autopsy performed on an animal. The results, available in about 20 days, will give researchers a better idea of the whale's cause of death.